Magic is a counted cross stitch worked on 14 count black Aida using three shades of stranded cottons. 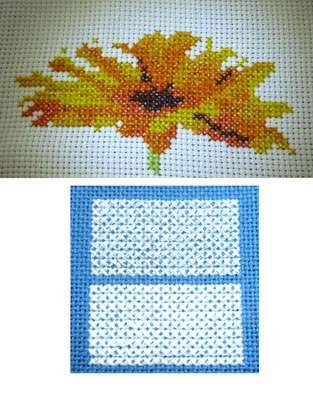 The pattern is worked in whole cross stitch, half cross stitch and backstitch cleverly using varying numbers of strands. 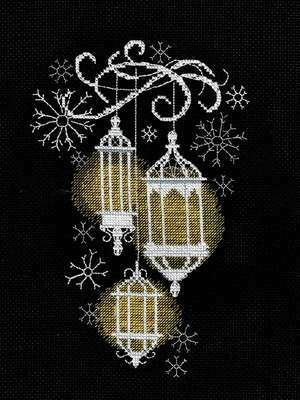 The white of the lanterns is in whole cross stitch using three strands of white. The yellow light is worked in half cross using three, two and then one strand as it works outwards. Grey floss is used to add depth to the lanterns. Some backstitched snowflakes are worked in two strands and some in one. The chart uses different colours to denote the number of strands used and so it is very easy to follow. I was hampered a little by the black fabric which slowed progress but there were no problems with the design and there was ample floss. Time to stitch - 28 hours. I came across a crochet pattern for a nursery rug in the shape of a cartoon snail. Our granddaughter has a few pet common or garden snails wintering in their house. I decided to make a smaller version for her and having started it planned to make it into a soft toy. When I came to put it all together a pipe cleaner just wasn't going to succeed for its 'horns'. So after a bit of thought I decided to use plastic canvas for the horns and the eyes which are at the ends of stalks. I cut suitable size small pieces and sewed them securely on the inside of the toy. Then I picked up stitched around the outside of the bases and crocheted around finishing the horns with polystyrene balls and the eyes with black buttons. Our granddaughter was delighted with the finished snail. Worryingly, she kept picking it up by the horns but they stayed the course. She pressed the two button eyes together and said 'eye to eye'. DMC's latest threads Etoile arrived this month. There are thirty five in total each a current colour but with added sparkle. Each strand has a fleck of silver sparkle at intervals. In the skein, the threads especially the lighter shades look a little grey, so I decided to try them out to see how they sew up. I used a flower pattern from the DMC web site and also stitched a block of Etoile Blanc with a block of B5200 for comparison. The Etoile is the top block. The finished stitching does sparkle especially in artificial light but it's very hard to reproduce that in a photo. We tried daylight, one spot light and two spot lights and just couldn't reproduce what our eyes saw. That should have been obvious from DMC's own marketing photos which clearly have added white spots. If you are interested in using this floss it would probably be worth trying out with one shade and you may be pleasantly surprised. Many years ago, possibly forty, I embroidered a picture of goldcrests. I probably used a transfer pencil for the outline and then worked it in surface embroidery using satin stitch, long stitch and long and short stitch. I used a single strand of floss, very small stitches and lots of different shades. The result was very realistic birds. Of course my eyesight was much better then. We have lots of tall conifers in our garden and we occasionally glimpse these tiny birds among them but they certainly don't visit our bird table. 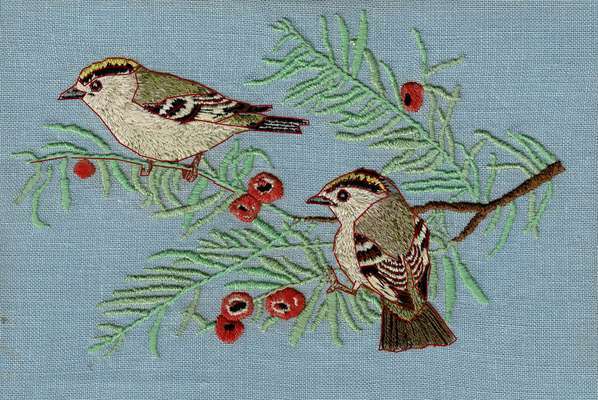 Many years ago, possibly forty, I embroidered a picture of goldcrests. I probably used a transfer pencil for the outline and then worked it in surface embroidery satin stitch, long stitch and long and short stitch. I used a single strand of floss, very small stitches and lots of different shades. The result was very realistic birds. Of course my eyesight was much better then. I love these symmetrical designs and the subtle shading in DMC Color Variations 4150 Desert Sand. I decided this would be a quick project and chose Permin 32 count CL065/95 Milk Chocolate which comes 46 cms square so that the pattern would be in the centre and it would be an ideal match for our damask cushion sofa. I did realise the pattern has nearly 5000 stitches but of course all whole cross stitch and no colour change. I didn't allow for my failing eyesight and stitching on darker fabric and after my first enthusiasm, I put the embroidery on the back burner. Eventually I brought it back out again to stitch on brighter days and although far from neat stitching I reached the end. My mother always says that I can do anything with a needle but sew, so there was another long pause while I considered how to complete the cushion cover but when I could ignore it no longer, I got it back out and completed the cushion. The finished article looks lovely in our conservatory where nobody will examine it closely. I can't fault the Ink Circles pattern at all but will be more careful on my choice of fabric count and colour in the future. Download the knitted lace edging pattern here. I decided to stitch this handbag mirror for a small present. The mirror and pouch look very classy. The design has some space in the centre so I added a monogram to personalise it for my friend. The kit comes with a small square of 18 count Aida and so had to be stitched without a frame but is stiff enough to hold its shape. There was ample floss left over to stitch a letter. The whole project could be worked in an evening. 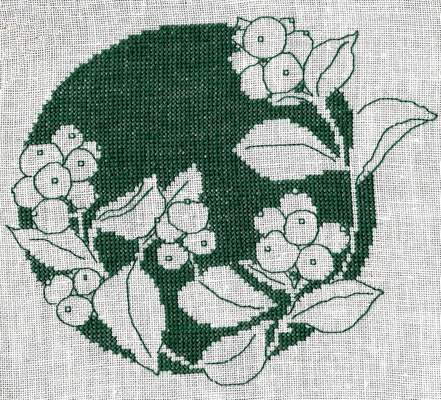 This is an Assisi style design with the background stitched and the leaves and berries unstitched. I hadn't used Danish Flower Thread and it seems very fine for cross stitch. However it covers the 32 count linen in the kit quite well. The pattern is fairly simply but some of the backstitch is quite tricky. Some stitches are worked over two threads in one direction and only one in the other which of course gives smoother lines especially since the berries are round. The finished design is quite striking and there was a whole skein unused. I'm going to mount it in a circular flexihoop and hang it at our conservatory window. These kits are from the Grafitec company who produce traditional screen printed needlepoint canvases. We visited their stand at a trade fair where they were introducing their new cross stitch kits which have the design printed directly onto the fabric. After stitching that is completely washed away. I was intrigued and decided to try one out. 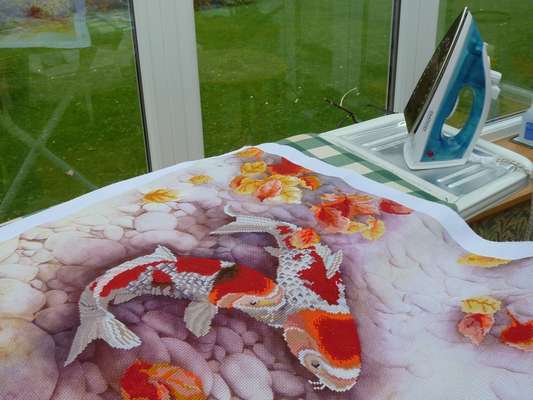 I was perhaps a bit ambitious in my choice of Koi Carp which is stitched on 11 count canvas and has a finished size of 67 by 57 centimetres (26 by 22 inches). Aida isn't my preferred fabric and I would normally have gone for 14 count but I did like the design which also has a printed background. The floss comes on numbered cards and needs to be halved in length and split into two lots of three strands to be used. The printing is exactly as the company claims, accurately printed on each block so unlike printed needlepoint canvas there are no decisions to be made and I cartainly preferred the precision. I find printed needlepoint pictures unsatisfactory. This design has twenty-eight colours so the key doesn't just have only coloured squares, it has some with symbols on top. I found some of these a bit too similar to identify and did sometimes refer to the full colour chart which is more traditional with black symbols on the actual shade of the floss. In fact at one point I did stitch a bit in the wrong colour before referring to the picture and then the chart. This may not apply with smaller designs or those with fewer colours of floss. I was aware throughout that I would be washing the finished embroidery so made the starting and finishing lengths of thread longer than normal but there was still ample floss left over. Finally, I completed the stitching and reached the exciting bit where I washed out the stitching grid. As suggested I washed twice and rinsed thoroughly and yes, everything disappeared, except of course the background and faint remnants of the key. The first Needleart World catalogue has 52 designs ranging in size from 12 centimetres square to 85 by 62 centimetres with some on 14 count Aida and some on 11 count Aida so there are a limited number of designs. But if you find a design you like and are happy to work on Aida, I could certainly recommend them. 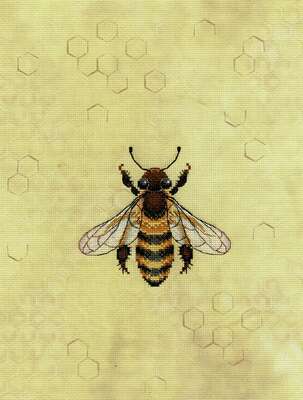 Review of Grafitec Needlepoint Canvas ... Grafitec canvases are screen printed in full colour. Swedish Weaving ... Swedish weaving is also known as huck embroidery or huck weaving and became popular in the US during the 1930s and 40s. Outline stitches in Blackwork ... Until recently I used backstitch to outline areas in blackwork. Golden Crown Mark 2 ... Having learned from my first attempt at making a dressing-up crown, I decided to make a smaller lighter version. DMC Coloris ... We thought we'd try a design in the exciting new Coloris by DMC. A Golden Crown ... Our three year old granddaughter said ' Gran, I need a crown' . Uses & Care for Kreinik Metallic Ribbons ... Applications: crazy quilting (hand and machine), crewel, cross stitch/counted thread, doll making (hand and machine), fly fishing, kids' crafts, machine embroidery/bobbin work, machine embroidery/couching, needlepoint/canvas work, plastic canvas, ribbon embroidery, stumpwork, weaving. Transferring designs to fabric for surface embroidery ... We were recently asked how to transfer your own design onto fabric to embroider. Seasonal Blooms by Brittercup Designs ... I've liked these designs ever since I first saw them so took this opportunity to try Winter. Witching Hour Ornament by the Prairie Schooler ... This cute design took only a couple of evening to stitch. Embroidered Table Covers ... Hand stitched printed table covers always look lovely on your dining table. Rico Design Hooded Baby Towels ... These baby towels make lovely gifts and can be used from birth and for many years. Easter Rabbit by Eva Rosenstand ... Eva Rosenstand kits are now produced by Permin of Copenhagen and the key and instructions are in the same format as their designs. Iphone 5 Phone Covers by Anchor. ... This is a quick and easy project worked completely in whole cross stitch on silicone covers. Flexihoops ... I decided to use one of these frames to mount the reversible Little Owl from the Classic Embroidery pattern. Review of Little Owl, blackwork kit by Classic Embroidery ... This pretty little design is sold as a 'weekender' and certainly can be completed in a weekend or a few evenings. Review of Believe by Designs Works ... A pretty little design of the word with fairies and beads. Review of Woodland Winter by Rose Swalwell ... A pretty little design from a seasonal set. Review of Gardener Chick by Heritage Crafts ... Heritage Crafts have lots of birds and flower kits converted from the artwork of Valerie Pfeiffer which are very pretty and timeless. Review of Cow - Sheep- Pig - Bull ... We decided that it would be a good idea to stitch a few different suppliers' kits to review them for our customers. Quaker Style ... Crewel work was very popular in Europe during the sixteenth and seventeenth century. Band Samplers ... Band Samplers are a very old form of embroidery dating back to the Late Middle Ages. Swedish Weaving ... This traditional craft had a revival in the 1930s and 40s and is becoming increasingly popular today. Counted Beadwork ... Beadwork was very popular in Victorian times when it was used to decorate evening dresses and bags and in furnishings such as cushions and footstools. Assisi Embroidery ... Assisi embroidery comes from the Italian town of that name and was once used to decorate ecclesiastical linens. Blackwork Easter Egg - a simple example. ... There's nothing very complicated about blackwork. Would you like to try hardanger ? ... Some of you have recently expressed interest in hardanger, so we decided to research the subject a little and look for a few products. New Baby? ... News of an expected new baby is always very exciting, and not just to the parents-to-be! Miss Potter - Renaissance Woman ... Hollywood has seen a ready market for adaptations of British childrens' classics - Alice in Wonderland, Winnie the Pooh, Peter Pan, and so on, but now director Chris Noonan has made a new movie based on the life of the storyteller rather than the stories. Christmas is coming, the goose is getting fat ... ... Or perhaps, «gravitationally challenged», but it just doesn't scan. Mounting Your Embroidery On Card ... This is a short piece with advice on mounting your embroidery on card for framing - what type of thread to use and how to do it. Not Another Embroidery! ... There are many, many cross stitch and embroidery designs and kits out there. Stitching Techniques And Tips ... An introduction to working cross stitch, blackwork and needlepoint designs with some useful tips and advice for beginners.